Original Part Number: 51757886 / 46845344. LANCIA MUSA. MUSA (350_): 1.3 D Multijet. ENGINE MOUNTING. Our Part Number: CM 85924. THIS PART SUITABLE FOR 09.2006 - 09.2012. 10.2004 - 09.2012. Part Number : 50105. The concepts of quality at Original Birth are Be aware that your Model of Vehicle may have a choice of 2 / 3 different Engine Mount Options. Such variations can apply due to upgrade designs on later chassis numbers, or the manufacturers using different OEM suppliers during production process. LANCIA MUSA 350 1.3D Engine Mount Right 04 to 12 Mounting QH. LANCIA MUSA (350_) 1.3 D Multijet MPV Diesel 10/2004 09/2012 FWD 16 70 51. LANCIA MUSA (350_) 1.3 D Multijet MPV Diesel 09/2006 09/2012 FWD 16 90 66. Engine Mount EM4561 Quinton Hazell. Part Number EM4561. Function Engine Mounting. FIAT PUNTO (188_) 1.2 Natural Power Hatchback Petrol/Natural Gas (CNG) 09/2003 03/2012 FWD 8 60 44. ORIGINAL IMPERIUM 29292. LANCIA MUSA 350 1.3D Engine Mount Lower 04 to 12 Mounting QH. LANCIA MUSA (350_) 1.3 D Multijet MPV Diesel 10/2004 09/2012 FWD 16 70 51. LANCIA MUSA (350_) 1.3 D Multijet MPV Diesel 09/2006 09/2012 FWD 16 90 66. Part Number : 51520. The concepts of quality at Original Birth are Be aware that your Model of Vehicle may have a choice of 2 / 3 different Engine Mount Options. Such variations can apply due to upgrade designs on later chassis numbers, or the manufacturers using different OEM suppliers during production process. LANCIA - MUSA (350) - 1.4. LANCIA - MUSA (350) - 1.4 LPG. LANCIA 46844208. LANCIA 46528871. Body Style. Engine Code. 188 A5.000 - FIAT - 1242 57 78 4. 188 A4.000 - FIAT - 1242 44 60 4. Original Part Number: 46809633. MUSA (350_): 1.4. ENGINE MOUNTING. PUNTO (188_): 1.2 Natural Power. Our Part Number: CM 85921. THIS PART SUITABLE FOR 10.2003 - 12.2011. 10.2004 - 09.2012. LANCIA MUSA (350_) 1.4 MPV Petrol 10/2004 09/2012 FWD 16 95 70. Independent garages trust in CORTECO spare parts and therefore benefit from the original quality made by Freudenberg. LANCIA 46528865, 46809633, 46844207. LANCIA MUSA (350) 1.4 MPV Petrol 10/2004 on FWD 16 95 70. Independent garages trust in CORTECO spare parts and therefore benefit from the original quality made by Freudenberg. LANCIA 46528871 46844208. Part Number : 50107. The concepts of quality at Original Birth are Be aware that your Model of Vehicle may have a choice of 2 / 3 different Engine Mount Options. Such variations can apply due to upgrade designs on later chassis numbers, or the manufacturers using different OEM suppliers during production process. Upper right hand side engine mounting part numbers LFA 27800 and 322A12E. Genuine Original (O.E.) Parts for Fiat/Lancia/Alfa 1.9 D/JTD engine Every single individual item I list has its own photographs taken, unedited, in the interest of authenticity. Fitting Position:Left. Part specifications. 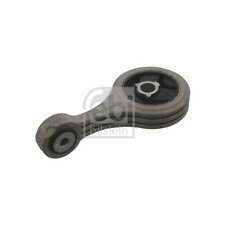 Part Number:OE-46809633. This is an original quality part manufactured by Febi. Alternator and belt tensioner mounting. Every single individual item I list has its own photographs taken, unedited, in the interest of authenticity. The item you will receive, is the exact one shown in the pictures. Part Number: FSM5109 (Ref.Only). Model: Musa. Make: Lancia. LANCIA : 46746546. LANCIA : 46746546 S1. LANCIA : 50702204. LANCIA : 50702206. LANCIA : 50706933. Why this exclusivity?. Engine Mounts are used to connect the vehicles engine to the vehicle itself. We apologise in advance for any inconvenience caused. Part Number : 51540. The concepts of quality at Original Birth are Be aware that your Model of Vehicle may have a choice of 2 / 3 different Engine Mount Options. Such variations can apply due to upgrade designs on later chassis numbers, or the manufacturers using different OEM suppliers during production process. Part Number : 51303. The concepts of quality at Original Birth are Be aware that your Model of Vehicle may have a choice of 2 / 3 different Anti roll bar engine mount Options. Such variations can apply due to upgrade designs on later chassis numbers, or the manufacturers using different OEM suppliers during production process. Fuel Injection Pump Mounting bracket, complete with mounting bolts for attaching it to the engine. Genuine 1.9 JTD/CDTi parts Every single individual item I list has its own photographs taken, unedited, in the interest of authenticity. Engine Mount FEM3072 First Line. Part Number FEM3072. FIAT 46528871, 46844208. QUINTON HAZELL EM 4371, EM4371. Function Engine Mounting. Fitting Position: Rear; Fitting Position: Lower. FORTUNE LINE FZ90861. FIAT 46528865, 46809633, 46844207. LANCIA 46528865, 46809633, 46844207. Engine Mounting Front Left 80000850 Corteco. Part Number 80000850. Independent garages trust in CORTECO spare parts and therefore benefit from the original quality made by Freudenberg. Genuine 1.9 JTD/CDTi Heavy solid steel mounting bracket for the fuel injection pump and top right hand side engine mounting. Every single individual item I list has its own photographs taken, unedited, in the interest of authenticity. Part Number : 51563. The concepts of quality at Original Birth are Be aware that your Model of Vehicle may have a choice of 2 / 3 different Engine Mount Options. Such variations can apply due to upgrade designs on later chassis numbers, or the manufacturers using different OEM suppliers during production process. LANCIA 46844208. LANCIA 46528871. Engine Components. We will always attempt to rectify the issue as fast as possible! You'll have the part ASAP. We just want you and your car to be happy! Eg, Vetech, Erst Klassig, Franzen, NK, etc. FIAT 46528871 46844208. LANCIA 46528871 46844208. Engine Mounting Rear Left 80000851 Corteco. Part Number 80000851. Independent garages trust in CORTECO spare parts and therefore benefit from the original quality made by Freudenberg. Part Number : 51517. The concepts of quality at Original Birth are Be aware that your Model of Vehicle may have a choice of 2 / 3 different Engine Mount Options. Such variations can apply due to upgrade designs on later chassis numbers, or the manufacturers using different OEM suppliers during production process. Engine Ancilliary Mounting bracket, complete with mounting bolts for attaching it to the engine. Every single individual item I list has its own photographs taken, unedited, in the interest of authenticity. Fitting Position:Left. Part specifications. Part Number:OE-46528871. This is an original quality part manufactured by Febi. From steering, engine, brake, chassis and wheel fastening technology to vehicle electrics - with a range featuring over 20,000 spare parts, you will always find exactly the part you need at febi. New Febi Bilstein Kit 4 x Car Strut Top Mounting Kit. Genuine OE Quality Febi Rear Lower Engine Mount Mounting - 36611. Why this exclusivity?. We apologise in advance for any inconvenience caused. Modern engines are precision assemblies - just like each individual spare part. FIAT 46844207. FIAT 46809633. FIAT 46528865. Part Number:70 93 2284. chassis number (VIN) and we will confirm the correct part required. Be aware that each model of vehicle may have a choice of few different part options. Such variations can apply due to upgrade designs on later chassis numbers, or the manufacturers using different OEM suppliers during production process. However delays are occasionally inevitable due to unforeseen circumstances. Fitting Position: Right. Weight [kg]: 1,5. Listed Part Number Fits to Following Vehicles. Fiat Punto 188 Hatchback 1.3 JTD 16V 03-06. LANCIA MUSA (350_) 1.4 LPG. 2 Year Warranty Febi Engine Mounting. FEBI QUALITY STRUT MOUNT. FEBI OE PRODUCTS. Catalyst Inc Fiting Kit. ENGINE COOLING. ENGINES & ENGINE PARTS. FIRSTLINE ENGINE MOUNTING. Fitting Position Transmission End. for OE No. 46809633. If the item is used, we are unable to accept the goods back. IN DOUBT WHETHER IT WILL FIT?. Any problem will be resolved regarding our support team.